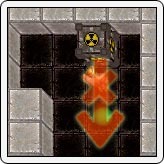 Objective of the game is to push all boxes on the marked places. 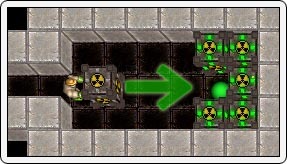 The box is emitting green light, when it's placed on the marked position. When all the boxes are placed, level is done. Unfortunately, you cannot move the boxes everywhere. Storekeeper can push only one box in the same time. Storekeeper can push the boxes only forward, he can't pull them back. That means, when the box is in a corner, you can't move it anymore. And when the box is aside a wall, you can only push it along. Maybe it looks simple, but sometimes it is a hellishly hard puzzle. You can select language in setup.exe. 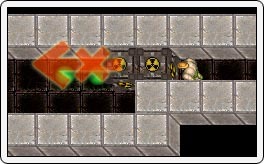 Storekeeper is controlled by cursor arrows. Game can be paused by pressing P. By pressing ESCAPE you can get into menu. In menu you can navigate with mouse.